If you’re a heavy foursquare user like I am, you know that your check-in data from over the years is pretty interesting to look at. While it’s extremely interesting, you might not have known how useful it could be. Part of the reason for that is because foursquare has focused on creating a killer app that allows you to log all of the places you visit for yourself, and for your friends. 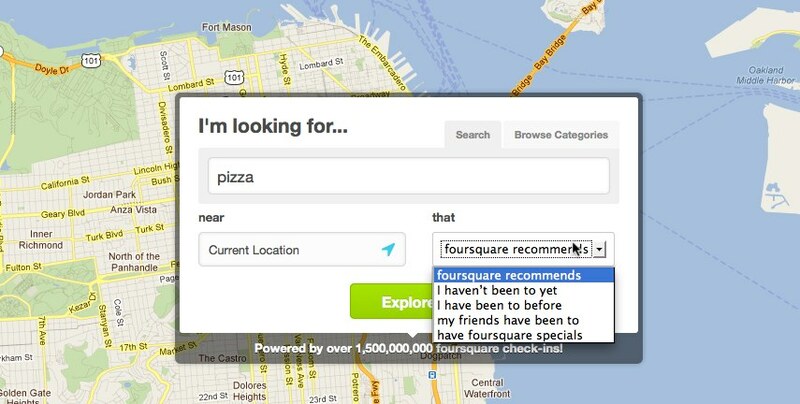 Today, foursquare took a gigantic leap forward by bringing its “Explore” offering to the web. Last November, the company gave its website a huge facelift by making foursquare places look prettier and easier to discover. This release goes way further than that, finally turning all of that check-in data into a real actionable web experience. 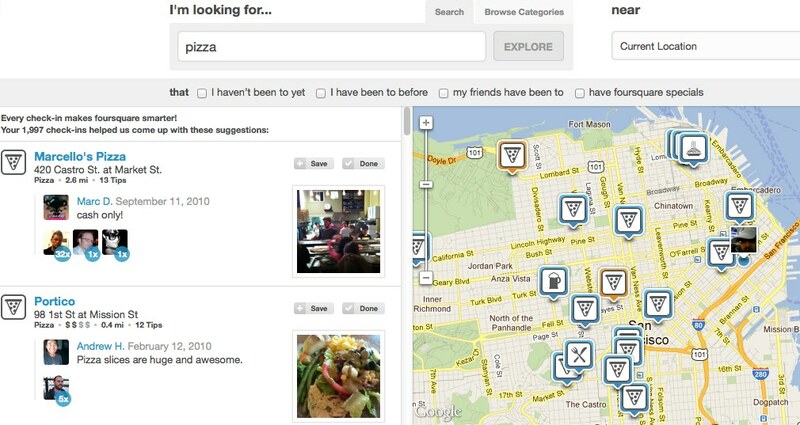 Finally, because Explore is powered by check-ins and foursquare Tips, it’s not just personalized, it’s specific. Search for ‘pool table,’ or ‘guacamole’; ‘deep dish,’ or ‘thin crust.’ Because not all bars, Mexican restaurants, or pizza joints are created equal, and we want to make sure you find what you’re craving. As the company has made efforts to make it easier to not only check-in, but share tips and specific information about a location, that data can now be used in any number of ways. We’ve already seen it in action with mashups like FoursCrowd, that predicts how busy a particular spot might be. 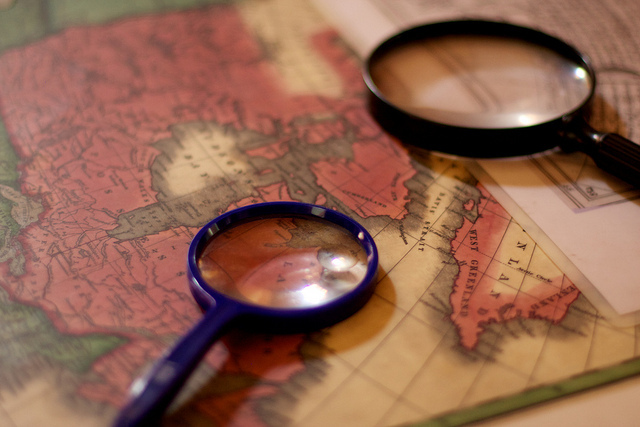 When you visit Explore on the web and login to your account, you’re presented with a map and search options. It now becomes a community driven and extremely social version of Google Maps, and also a way better offering than Google Places. The results themselves display in a way that makes all of the data you and your friends have given over the years seem worthwhile. If you’re looking for pizza in your area, you’ll be shown a map of all of the local places, along with information about them on the left. It’s not just information pulled from businesses or Yelp, it’s information that matters to you. You’re shown which of your friends have checked in, as well as pictures and tips about the venue. It’s as if this was foursquare’s master plan all along. To provide a rich experience like this, you need massive amounts of data. Phase 1 was the app, which brought the company that data. This phase brings everything together in a way that absolutely blows Google’s properties out of the water. Why? Because when you search for Places on Google, there’s not much information there. While foursquare has done deals with media properties for promotional purposes and specials with companies like American Express, this is the type of product that is easily monetizable. For example, foursquare could simply sell a premium listing that would show at the top of the results, much like Google does. By pulling all of our data together and presenting it to us in this useful fashion, foursquare has somehow found a way to make us want to use its service more often. Google on the other hand hasn’t found that “hook” as of yet with its social properties. Read next: Should iPads really be used for programming?